Hot on the heels of yesterday’s news that Warner Bros. and DC Comics had registered urls for upcoming superhero movies, one of them being Shazam, we know today that the movie is happening and it has its villain. 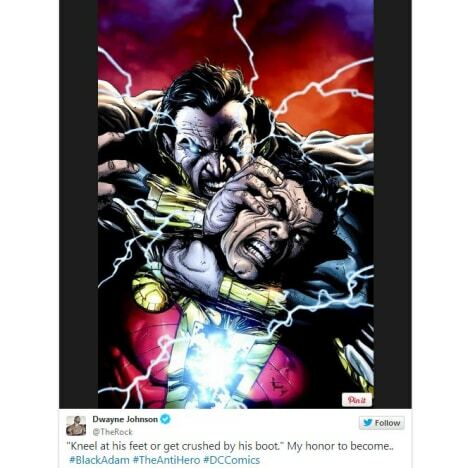 Dwayne Johnson took to Twitter this morning and posted his announcement that he has accepted the role of Black Adam in the Shazam movie and we cannot think of a better person to take the part. Johnson had been dying to be part of a superhero franchise for years and it wasn’t clear whether Marvel or DC Comics would get him. Then, it appeared that he was zeroing in on the Shazam movie for DC, but it wasn’t clear whether he would play Shazam or his arch enemy, Black Adam. Don’t get us wrong, we love seeing Johnson play the hero as he has done so many times. But, think about what devilish joy he’s going to have being bad in the Shazam movie?! Black Adam first appeared in 1945 and has been both villain and anti-hero in the comic universe, which could also be part of the appeal for Johnson. He has the same powers as Shazam, including his abilities of supreme strength and lightning manipulation -- not to mention magic as well. Stay with Movie Fanatic as more details emerge on this exciting news. When can we expect a Shazam movie? Well, according to a previously released story about the Warner Bros. and DC Comics superhero movie slate… July 2016. Check out Johnson in one of his most recent flicks and watch Fast and Furious 6 online.